For years, it has been common for people to have multiple social media accounts that they interact with on a regular basis, from Facebook to Twitter to Snap Chat to Instagram. 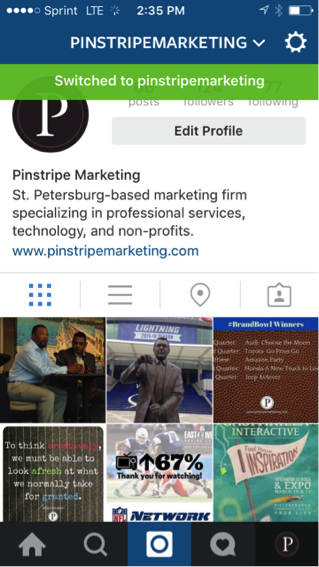 More and more frequently, people also have multiple accounts within a single social media app. For example, I have multiple Twitter accounts that I manage, four or more Instagram accounts, and several pages on Facebook for which I am an administrator. Hootsuite has made it simple to schedule and manage posts for Twitter and Facebook from one place, but Instagram has been the problem child for some time. Each time I wanted to post to a different Instagram account, I had to log out and log back in with the new account, which became frustrating and time consuming. 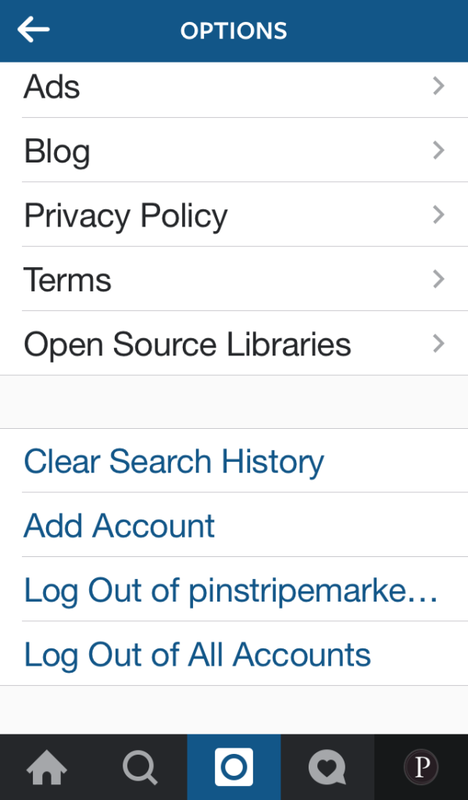 I searched for apps that could alleviate this bump in my social media flow, but nothing stood out as especially helpful, and most didn’t solve my main issue; logging in and out of Instagram on my mobile device. 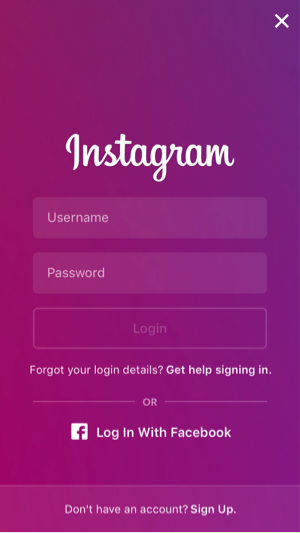 Instagram must have felt the pressure coming from users like us who are tired of logging in and out on mobile in order to manage multiple accounts. The new multiple account feature does just that – it allows you to stay logged in to several accounts with a simple drop down menu that gives you the freedom to switch between them. This simple, elegant solution makes perfect sense and is a game changer. Below is a step-by-step tutorial on how to use the new multiple account feature. Type in your username and password and your account will be added. 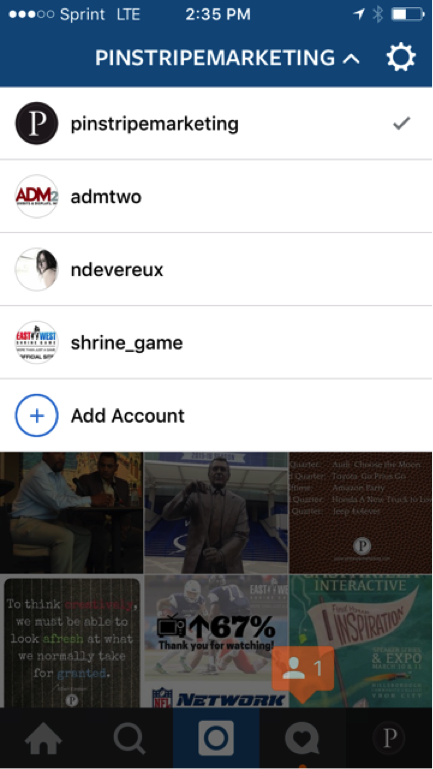 Once you have a second account, go to your profile page and tap your username at the top which will show a drop down menu to switch quickly between accounts and the option to add additional accounts. Simple as that. Thanks, Instagram! Is one of your New Year’s resolutions to grow your business? To do more marketing? To be more strategic? To work smarter, not harder? You’re not alone! Each year, our phones start ringing on January 2nd with clients ready to start off strong. If you need support to refresh your brand, launch that new web site, generate new content, shoot new videos, design new marketing collateral, build relationships with the media, or just to keep you on track – we’re here for you. Let’s set up a meeting and discuss your resolutions! Be More Awesome in 2016! What Makes a Survey Worthwhile? We’re all familiar with ubiquitous greeting, “How are you?” Instinctively, we understand the only socially acceptable answer is “I’m fine.” If someone is truly interested, he or she might place a hand on our shoulder, look into our eyes with a concerned expression and say, “Seriously, how are you?” That’s how you should approach any survey conducted for marketing purposes; you must sincerely care about getting a truthful answer. Of course, there’s one really big difference in our analogy: A survey for your business may seem to inquire as to how your customers feel, but what you’re really asking is, “How am I?” You may not really care how Uncle Ed is adjusting to his low-sodium diet, but you do have a huge interest in your own company. Honesty in survey responses is everything. Only accurate answers are going to provide the intelligence you need for: identifying your true value proposition and managing your brand; making decisions regarding your product or service offerings; correcting operational deficiencies; or taking advantage of developing opportunities. Caring about what your customers (or prospective customers) really think about your business is just the starting point for creating a worthwhile survey. Here are a few rules for survey construction that will put you on a path to gaining actionable information. Screen your survey subjects. Is the respondent a customer or someone who could easily become a customer? Demographics-related questions will help answer these questions. You might also want to ask questions to help weed out anyone with an incentive to provide faulty information such as someone working for a competitor. Be clear what you are asking about. Ambiguity is your enemy. Generally speaking, short, direct questions are best—provided there’s a relatively limited list of logically possible answers. Longer questions can be okay provided they help narrow the respondent’s focus by setting parameters of consideration. Group questions for logical progression. How questions are arranged will aid your subjects’ focus on various areas of interest within a survey. For longer surveys, distinctive grouping will help respondents feel they are making progress completing the questionnaire. Provide applicable answer options. Many questionnaires provide survey subjects with a range of answer options—usually four or five. This will work fine, if you’re confident the vast majority of respondents will choose some answer other than “I don’t know” or “N/A.” A better approach may be to ask subjects to pick a point on a sliding scale to indicate their level of agreement, like or dislike, likelihood of taking some kind of action … etc., in response to the question. Keep it brief. Any survey that takes longer than 5 – 10 minutes for the average person to complete is probably going to test respondent patience. You don’t want people to give up—or worse—hurriedly answer questions without regard to accuracy. If the survey absolutely has to be longer than 10 minutes, give the subject fair warning before they begin. Group your respondents by their demographic profiles to help spot trends. Record every question result to establish a baseline against which to measure future surveys. Follow through and follow up. There’s really no point of doing a survey unless you act on the results. Additionally, you want to let your respondents know that you value their input, with some small token of appreciate if possible but a thank you email at a minimum. The ‘science’ of surveys is relatively straightforward. The ‘art’ is in the interpretation. Initial thoughts of “what does this mean?” will often be followed by “but what does this really mean?” Talk the results over with: trusted staff members, friendly peers in your industry, insightful friends and family members, or even some of your best, longest-term customers. An openness to other assessments will keep you from hearing just what you want to hear, or from making mountains out of molehills. Finally, resist the urge to be defensive in your reaction to negative survey results. Marketing research is designed to help improve your business. (You can’t improve what’s already perfect … and no organization is perfect.) Think of criticism as being like a friend who lets you know you have spinach stuck on a front tooth. Conversely, if your feedback is glowingly positive, don’t simply set back on your laurels in smug satisfaction. Build on success by getting busy using the things you do well as a springboard for new outreach and business growth. From time to time, you may have heard the phrase ‘value proposition.’ If you didn’t (or still don’t) know what that is, you aren’t alone; many business owners have a hard time nailing it down. Yet unless you accurately identify your company’s value prop, your promotional efforts will never be cohesive, nor as effective as they should be if you want the best return on your marketing investments. Okay, enough dramatic buildup … so what is a value proposition? In simplest terms, it’s the main thing that distinguishes your company from others in your line of work. As practical definition, your value prop would be consistently referenced by knowledgeable consumers—who’ve patronized both your business and your strongest competitor—as their top reason for recommending you. You may notice that the preceding examples are mostly business-to-consumer (B2C) rather than business-to business (B2B). (Staples and UPS serve both markets.) These companies were cited because their brands are so commonly known; we’ve almost all visited those stores at some time or at least seen their ads. However, the value prop categories are applicable to B2B companies as well. For example, technology service providers may recognize SAP, a provider of business management software for companies of all sizes and the company’s solutions require significant investments in money and training. SAP stresses quality and value through production gains through greater operational efficiency, and ran a “Run Better” campaign to get the point across. Another B2B example is ADP, a provider of payroll services for small businesses. By stressing the company’s expertise in all aspects of payroll management (time and attendance, time and tax, human resources), we essentially see the one-stop-shop appeal to Convenience. Yet another, highly professional company with a strong profile is Deloitte. The fact that this global network of accounting firms often run ads with little or no copy—just the company name and an image—gives the impression that Deloitte is the only name you need to know when you’re looking for the company’s exceptional expertise. This puts the Deloitte brand squarely under the Quality banner. Obviously, every business could claim something worthwhile from just about any of these broad value-prop categories. And frankly, if your business is woefully lacking in any of these areas, you have a major problem. But remember, your true value prop is the one that stands head and shoulders above the rest. And when you make it central to your brand messaging, your marketing will ring true with customers and be all the more effective. As you can see, a value prop isn’t a slogan or a tagline; though you should certainly incorporate its essence into such phrases—as did our examples. Essentially, all your marketing communications should be a statement (sometimes blatant, sometimes subtle) in support of your value-prop assertion. Let’s return to the idea that a company is successful because of the great location. This comes under the Convenience heading. An ad might lead with a headline that stresses location by saying something like “Hi, Neighbor!” Then you could follow that up with copy about how easy your business is to reach, your business hours, wide selection … or any other convenience-related feature. See, you don’t have to ignore your secondary value props. Instead, you position them to support the overarching idea—like spokes in a wheel. You should do the same thing when introducing new products and/or services. After a while, people will stop thinking of our mythical company as a quick and easy stop on the way home from work. Instead, the brand identity will have been molded into a paragon of convenience and all that entails, simply because the marketing was based on the actual value proposition. If you’re still trying to figure out what your value prop is, here’s a suggestion: ask people who are familiar with your business. Specifically, ask your customers. Whether through formal survey’s or casual conversation, elicit their opinions and take notes. Your own thoughts might be confirmed or you might be surprised, but either way, you need to know for sure. The book 20 Master Plots and How to Build Them came at the perfect time for us. Over the last couple of years, content writing has become more about the story and less about “keyword stuffing.” As we discussed in a previous article, during this time Google has learned how to read and distinguish between a well-written article with useful information and an article that is written solely for the purpose of capturing Google’s own attention. The reason Google does this is because it wants the user to find the most relevant content for the terms they are searching. A happy user is Google’s ultimate goal and should be yours as well. These are your prospective clients. For this reason, content writing is about conveying pertinent, useful, interesting information to your readers. What better way to capture your current and prospective clients’ attention than by making them the heroes of your story? This is the direction we’ve taken in the last couple of years, and it’s working. We have seen firsthand that stories about people are more engaging and generate more traffic. Make the client the protagonist, tell a great story, and you captivate people. 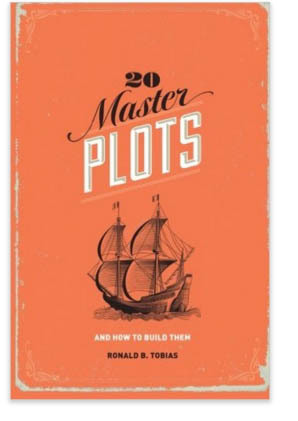 This is why 20 Master Plots and How to Build Them arrived on our bookshelf at the perfect time. We needed some solid story-telling background. Of the 20 plots that Tobias discusses, we thought that two were most useful for content writing – action and adventure. If we apply these two plots to content writing for business, it will assist us in organizing our content into more compelling stories that draw readers (potential clients or referral sources) in and urge them to read more. Note that although we would love to be the hero, let’s face it, the client is always the hero, so move over and let them shine. One of our personal favorites is the plot where the client has a lofty goal and while they are trying to achieve that goal, an obstacle is set in their way. The client’s team is then challenged to overcome the obstacle in order to reach their goal. Of course, the story isn’t satisfying if there is complete failure, so we avoid those (remember, always make the client look good! ), but when the protagonist is challenged and claims victory, this is exciting for everyone involved, and the story is more interesting. This is the kind of story everyone tells at the water cooler on Monday morning. It’s a good story because it gives people a thrill. Affect people’s emotions and you will reach them on a more personal level. If you are writing content for your business or your clients, we recommend reading 20 Master Plots and How to Build Them to derive some interesting insights into weaving stories into your content. Sometimes it is difficult to come up with interesting, captivating content, so this may be just what you need to spice up your writing and give you a fresh perspective.